PURPOSE: To transmit updated information and guidelines for the design and installation of center line rumble strips on appropriate segments of paved roads in the United States. This information applies to a wide range of projects including new construction, reconstruction, resurfacing, and safety improvements. Highway professionals should consider the needs of all road users, existing roadway conditions, the scope of the project, and the surrounding environment when applying this information and guidance. CANCELLATION: This Technical Advisory supersedes the information on centerline rumble strips contained in Section 9f of T 5040.35, Roadway Shoulder Rumble Strips, dated December 20, 2001 and T5040.40, Center Line Rumble Strips dated April 22, 2011. DEFINITIONS: A center line rumble strip is a longitudinal safety feature installed at or near the center line of a paved roadway. It is made of a series of milled or raised elements intended to alert inattentive drivers (through vibration and sound) that their vehicles have left the travel lane. In most cases the center line pavement marking is placed over the rumble strip, which is sometimes referred to as a center line rumble stripe. BACKGROUND: One of the Federal Highway Administration's primary safety goals is to reduce the number and severity of roadway departure crashes. These consist of run-off-road (including cross median) crashes and cross center line crashes on undivided roads. Safety improvements proposed to address this goal include initiatives to keep vehicles on the roadway, to improve the likelihood of a safe recovery after a roadway departure, and to reduce the severity of those crashes that do occur. Center line rumble strips are one of the proven countermeasures that reduce the risks of cross center line crashes. The problem: Recent crash data indicates nearly 20 percent of roadway departure fatal crashes involve an opposing direction collision. The NCHRP 500, Volume 4: A Guide for addressing Head-On Collisions found similar statistics. According to NCHRP 500, "75 percent occur on undivided two-lane roads," and "most head-on crashes result from a motorist making an unintentional maneuver." The target driver: Center line rumble strips are placed as a countermeasure for driver error, rather than roadway deficiencies. They are designed primarily to assist distracted, drowsy or otherwise inattentive drivers who unintentionally stray over the center line. For this set of drivers, the audible and vibratory warning produced by center line rumble strips greatly improves the chances of a quick and safe return to their lane. Where drivers don't safely recover, the warning created by rumble strips often improves driver reaction, reducing crash severity. Development of center line application: Pavement surface textures and treatments to provide audible and vibratory warning to drivers have been in use for over 50 years as a means to alert drivers leaving the roadway. It was not until the 1990s that this strategy was applied to prevent head-on collisions on two-lane roads. Lessons learned in the development of shoulder rumble strips have been applied to center line rumble strips, which have consequently been almost exclusively milled-in. Initial studies placed the rumbles in corridors with a history of opposite direction collisions and were found to be very effective. Striping the rumble strip: A variety of rumble strip patterns have been used, typically placing the center line markings over the rumble strip. This practice improves nighttime marking visibility, particularly in wet conditions, by better positioning the marking optics on the back side of each rumble, compared to limiting them to their normal position within the flat marking. The practice can also increase the longevity of the markings, particularly within the rumble, due to reduced wear from tires and added protection from plowing activity. EFFECTIVENESS: The target crashes for center line rumble strips are head-on and opposite direction sideswipe collisions, along with single vehicle run-off-road crashes to the left. For these crash types, center line rumble strips are among the most cost-effective countermeasures available. Head-on and opposite direction sideswipe collisions: For these two crash types, NCHRP Report 641 documents milled center line rumble strips provide statistically significant reductions in injury crashes of 38 to 50 percent on rural two-lane roads and 37 to 91 percent on urban two-lane roads. Navigational aid in bad weather: Center line rumble strips may also serve as an effective means of locating the travel lane during inclement weather. Fog, snow or blinding rain often obscure pavement markings. The vibration provided by rumbles can assist drivers from unintentionally crossing the center line in these conditions. In addition to vibration, there are improved visibility benefits. Even a light rain can seriously reduce the retroreflective capacity of pavement markings. When the pavement marking is placed in the rumble strip, the vertical component of the center line rumble stripe will often still be visible under these adverse conditions. APPLICATION CONSIDERATIONS: Center line rumble strips have the potential to reduce opposing direction crashes on any undivided, paved road with a marked center line. A summary of rumble strip practices and policies as of 2005 is included in NCHRP Report 641. Corridor vs. spot treatment: Due to the difficulty in determining where a driver will become distracted or drowsy, it is recommended that center line rumble strips be installed system-wide or in corridors, prioritized by the frequency of the specific crash types targeted by the treatment. Agencies may use crash predictors such as traffic volume or trip types (e.g. shift workers, younger drivers). Crash history will often reveal high-priority corridors. Spot installations are not expected to be as effective. However, within a corridor application, there may be spots where discontinuing the center line rumble strip installation may be prudent. Some of these issues are covered under Sections 9 and 10. Urban vs. rural: While rumble strips have been extensively used in rural areas where head-on crashes are prevalent, application on roadways functionally classified as urban is also effective. Whether the roadway is classified as rural or urban, the use of rumbles should be determined on the merit of the cross-section and appropriate to the context. Characteristics and concerns that often limit the usefulness or application include, low speeds, noise for adjacent residences, pavement width, and significant amounts of turning movements across the center line. Pavement width: Center line rumble strips may not be appropriate for very narrow pavements, as some studies have shown that centerline rumble strips can result in vehicles moving slightly away from the centerline. Combination of shoulder and center line rumble strips: The practice of installing both center line and shoulder rumble strips along the same segments of road is becoming more common. A Missouri study of the installation of rumble strips with wider markings during resurfacing showed the greatest reduction in serious injury crashes were found when both center line and edge line rumble strips were installed along with the wider markings. When applying shoulder and center line rumble strips in combination, consideration should be given to total pavement width to determine how to best accommodate and serve all road users, particularly in no passing zones where drivers may be reluctant to cross the center line to pass a bicyclist (see Section 9). DESIGN: The design of rumble strips factors into their effectiveness. The terminology used in this technical advisory is shown in Figure 1. Types: There are four basic rumble strip designs or types: milled-in, raised, rolled-in, and formed. Typically, only milled rumble strips are used in center line applications. Dimensions: Optimum dimensions for milled center line rumble strips depend on operating conditions, cross-sectional characteristics, and potential road users. Two key dimensions that have the greatest effect on the alerting sound and vibration of rumble strips are depth (D) and width longitudinal to the road (C) as shown in Figure 1. Most crash studies referenced here evaluated center line rumble strips of 7 inches wide (C) by 16 inches long (B) with a depth (D) of one-half inch. One study showed the variation in length transverse to the road (B) had the least effect on noise produced compared to the other dimensions. The same study indicated that a rumble acting on the driver side tires, such as a center line rumble strip, produced more noise in the vehicle at the critical driver position than rumbles on the right, indicating a center line rumble strip may not need to be as deep as a shoulder rumble strip to provide the same audible warning to the driver. Location: Center line rumble strips are typically placed at the center of 2-lane or 4-lane undivided roads and may lap across a longitudinal pavement joint. A few agencies have design details to avoid cutting the strip across the joint - typically by narrowing the rumble strip and placing the strip on each side of the joint, if the remaining pavement width is adequate. Where pavement width is available, this may provide a small amount of additional buffer between vehicles moving in opposite directions. Continuous application: To maximize the effectiveness of this countermeasure in a given corridor, it is desirable for the rumble strips to be installed on as much of the roadway length as feasible. Therefore, most center line rumble strips are installed without any breaks or gaps except at intersections and major commercial driveways. Many agencies use center line rumble strips in passing zones and there has been no indication that this inhibits passing activities among vehicles, including motorcycles. INSTALLATION: Typically center line rumble strips are placed so that the center line pavement markings, which may consist of one or two lines, are contained within the rumble. Monitoring is necessary to ensure the proper depth and center to center spacing is maintained throughout the length of the installation. Milled center line rumble: Most North American transportation agencies mill rumble strips into their asphalt or concrete pavement. The milling operation can be performed at any time, either in small quantity as part of a construction project, or in large quantity, taking advantage of the economy of scale by installing rumble strips for long sections or a number of corridors. Other types: Profile markings or other raised rumble strips comprised of raised pavement markers or other available products are sometimes used in climates where snow-plowing is not a common occurrence. They increase visibility, but their effectiveness in providing audible and vibratory warning depends on the patterns and dimensions. Rolled-in and formed rumble strips are not typically used in the U.S. for center line rumble strip applications due to construction limitations and other concerns which are discussed further in T 5040.39, technical advisory for shoulder and edge line rumble strips. Complications caused by normal crown: When milling into crowned pavements, agencies should be aware of several challenges. First, the milling machine should be equipped with a vertical alignment guide to orient the rumbles on the horizontal, rather than tilted level with the crown on one side of the joint or the other. Second, since the rumble strip depth will vary across the length of the rumble transverse to the roadway (B); specify the desired maximum and minimum depth. Lastly, project documents should clearly indicate where the rumble strip depth will be measured and the acceptable tolerances. Rumble Stripes: Milling over existing pavement markings initially reduces the area of the marking visible to the motorist. Unless the final location of the center line is intentionally outside the rumble strip, proper installation of center line rumble stripes includes the step of restoring the pavement marking over the top of the rumble strips. ACCOMMODATION OF ALL ROAD USERS: Safe accommodation of all road users should be considered when designing and applying rumble strips. This includes passenger and commercial vehicle drivers, bicyclists, pedestrians, and others. Flexibility is provided within this advisory to address the needs of these users based on the existing and projected use in the specific corridor. Motorcyclists: Although studies indicate that center line rumble strips used in passing zones do not inhibit motorcyclists from passing, awareness of the rumbles strip by the motorcyclist is important. The MUTCD includes warning signs and plaques specifically for motorcyclists which may be appropriate in some locations. Bicyclists: While bicyclists will rarely need to cross a center line rumble strip, the presence of the rumble strip may cause passenger and commercial vehicles to shy away from the center (as noted above in Section 6c). This effectively moves these vehicles closer to bicyclists who may be traveling on the outer edge of the lane. It is recommended that agencies maintain 14 feet of pavement beyond the edge of the center line rumble where vehicles and bicycles are expected to share the lane. Truck Drivers: Where corridors carry a significant volume of truck traffic, designers should take into account both the applicability of the warning properties of rumble strips to trucks, and the appropriate placement within the pavement cross-section. Due to the larger tires on trucks, to alert a truck driver crossing the center line, the length, width and depth are critical and should not be reduced. Consideration of noise should also be taken into account in curvilinear alignment or segments with both center line and edge rumbles due to the potential for off-tracking. MITIGATING ADVERSE EFFECTS: A balance between the safety of motorists, the potential adverse effects on the life of the pavement, and effects on nearby residents should be considered when installing rumble strips. Maintenance: Pavements are typically constructed with a longitudinal joint along the center of the road. For asphalt pavements, poorly constructed joints or degradation over time may allow the entry of water, leading to early pavement deterioration. Rumble strips provide another potential reservoir to hold water, and is perceived to accelerate this joint deterioration. Experience has shown that traffic flow near the rumble keeps water from accumulating in the strip. Where there are deterioration concerns, an asphalt fog seal can be placed over milled-in strips to reduce oxidation and moisture penetration. Noise to adjacent residents: Citizen acceptance of a state or local agency safety countermeasure should be taken into consideration as it can affect the long-term viability of that strategy. The noise produced by vehicles encountering a rumble strip generally is not pleasant to residents along the roadway. While residents would not normally complain about a rumble noise that averted a traffic crash, most rumble noise results from incidental contact where the vehicle might not have been heading toward a crash. Agencies can slightly affect the volume of the noise generated by rumbles through design modifications; however, they can greatly control the frequency of incidental contacts by attention to placement details. For instance, gaps in the rumbles are commonly provided in the vicinity of intersections and driveways, where they would be crossed by left-turning traffic. Some other placement features are more difficult to deal with. Horizontal curvature can produce incidental contact due to vehicles off-tracking. These contacts can be reduced with spiral transitioning or curve widening. Placement of rumbles in passing zones will result in expected noise from passing maneuvers, for which there is no easy solution. With some of the very first installations, agencies did not place rumbles in passing zones but quickly discovered that a continuous application was necessary to adequately address the safety problem. Most agencies mitigate what they can, but still install the rumbles at these locations. PUBLIC INVOLVEMENT AND OUTREACH: Transportation agencies should follow established procedures to involve all road users and stakeholders (including motorist associations, bicycle organizations, enforcement agencies and emergency responders) in developing rumble strip implementation standards and practices. This can help establish expectations for projects with varying scopes of work and expedite project development. When an agency is introducing center line rumble strips into an area for the first time or on a large scale, they should consider public outreach to inform the general public of the safety goals, explain how the treatment works, present historical success, and explain mitigation measures. Proactive newspaper articles, explanatory brochures, web-based videos, agency websites, and a variety of other outreach efforts have been used by many state DOTs and local agencies for this purpose. The expense of removing rumble strips can be significantly higher than the installation cost, so careful consideration of design and application along with public involvement and outreach often provides the most efficient use of limited funds. System-wide on undivided rural roads with posted or statutory speed limits of 50 mph or greater where the lane plus shoulder width beyond the rumble strip will be at least 14 feet (i.e. systemic safety projects). Along rural and urban two-lane road corridors where significant opposing direction crashes that involve any form of motorist inattention have been identified (i.e. location-specific corridor safety improvements). During any highway project with a history of head-on and opposing direction sideswipe collisions, or where center line rumble strips were overlaid during the paving process (e.g. reconstruction or resurfacing projects). Modify the design and application of rumbles to the extent the agency considers appropriate to meet the safety goal. Public Involvement and Outreach: Established public involvement procedures should be followed to ensure road user and community needs are properly addressed. When rumble strips are being introduced on a large scale or in a new area, public outreach should also be considered. 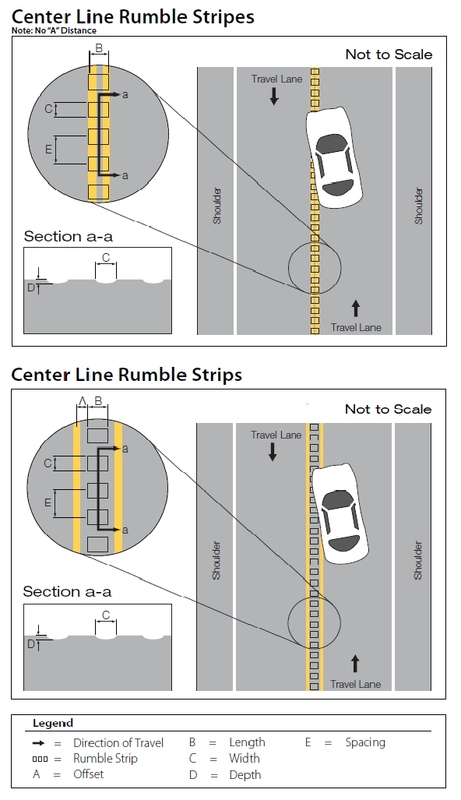 REFERENCES: The following resources are available on center line rumble strips. Neuman, Timothy R. et al., Guidance for Implementation of the AASHTO Strategic Highway Safety Plan, Volume 4: A Guide for Addressing Head-On Collisions, National Cooperative Highway Research Program Report 500, 2003. Torbic, D.J. et al., Guidance for the Design and Application of Shoulder and Centerline Rumble Strips, National Cooperative Highway Research Program Report 641, 2009. Sayed, T., Impact of Rumble Strips on Collision Reduction on British Columbia Highways: A Comprehensive Before and After Safety Study, Transportation Research Record 2148, 2010. Russell, Eugene R. and Margaret J. Rys, Centerline Rumble Strips - A Synthesis of Highway Practice, National Cooperative Highway Research Program Synthesis 339, 2005. Persaud, B.N., Crash Reduction Following Installation of Centerline Rumble Strips on Rural Two-Lane Roads, Insurance Institute for Highway Safety, 2003. Miller, Kenneth W., Effects of Center-Line Rumble Strips on Non-Conventional Vehicles, Minnesota Department of Transportation, January 2008. Carlson, Paul J. et al., Evaluation of Wet-Weather and Contrast Pavement Marking Applications: Final Report, Texas Transportation Institute, 2007. Potts, Ingrid B.et al., Benefit-Cost Evaluation of MoDOT's Total Striping and Delineation Program, Midwest Research Institute, 2008.